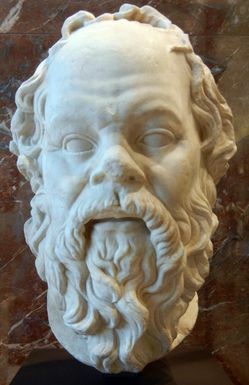 Socrates, a citizen of Athens, had a habit of challenging received wisdom, which made him unpopular with most people, although he was idolized by a few young men who liked challenging received wisdom. 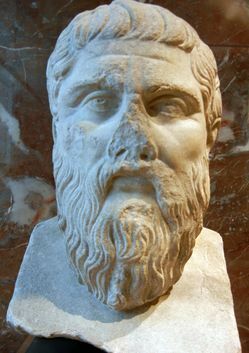 One of them was Plato, shown here, through whose writings we know what Socrates had to say. Another was Phaedo, whose account Plato reports here. In this passage, Plato quotes Phaedo telling their friend Echecrates what happened. He is speaking at a place called Phlius (Φλειοῦς), in the northern Peloponnese, far from Athens, at a time some days or weeks after Socrates’ death. The entire selection here represents the supposed words of Phaedo. Phaedo begins by explaining why, after Socrates was condemned to die, the execution was delayed. This 1871 translation by Benjamin Jowett was regarded as one of the finest English translations of Plato ever done, but Jowett was a perfectionist and kept changing it. The version here was published in 1892, a year before his death . It is copyright free. I have added quotation marks to set off the words of Socrates and others whom Phaedo is quoting. I have also added numbered subtitles to facilitate reference during discussions. … The reason [for the delay] was that the stern of the ship which the Athenians send to Delos happened to have been crowned on the day before he was tried. … This is the ship in which, as the Athenians say, [the mythological hero] Theseus went to Crete when he took with him the fourteen youths, and was the saviour of them and of himself. And they were said to have vowed to Apollo at the time, that if they were saved they would make an annual pilgrimage to Delos. I remember the strange feeling which came over me at being with him. For I could hardly believe that I was present at the death of a friend. And therefore I did not pity him, Echecrates! His mien and his language were so noble and fearless in the hour of death that to me he appeared blessed. I thought that in going to the other world he could not be without a divine call, and that he would be happy, if any man ever was, when he arrived there, and therefore I did not pity him as might seem natural at such a time. I will begin at the beginning, and endeavour to repeat the entire conversation. On the previous days we had been in the habit of assembling early in the morning at the court in which the trial took place, and which is not far from the prison. There we used to wait talking with one another until the opening of the doors (for they were not opened very early); then we went in and generally passed the day with Socrates. On the last morning we assembled sooner than usual, having heard on the day before when we quitted the prison in the evening that the sacred ship had come from Delos; and so we arranged to meet very early at the accustomed place. On our arrival the jailer who answered the door, instead of admitting us, came out and told us to stay until he called us “for the Eleven,” he said, “are now with Socrates; they are taking off his chains, and giving orders that he is to die today.” He soon returned and said that we might come in. “Tell him, Cebes, he replied, what is the truth — that I had no idea of rivalling him or his poems; to do so, as I knew, would be no easy task. But I wanted to see whether I could purge away a scruple which I felt about the meaning of certain dreams. In the course of my life I have often had intimations in dreams ‘that I should compose music.’ The same dream came to me sometimes in one form, and sometimes in another, but always saying the same or nearly the same words: ‘Cultivate and make music,’ said the dream. “And hitherto I had imagined that this was only intended to exhort and encourage me in the study of philosophy, which has been the pursuit of my life,  and is the noblest and best of music. The dream was bidding me do what I was already doing, in the same way that the competitor in a race is bidden by the spectators to run when he is already running. “But I was not certain of this; for the dream might have meant music in the popular sense of the word, and being under sentence of death, and the festival giving me a respite, I thought that it would be safer for me to satisfy the scruple, and, in obedience to the dream, to compose a few verses before I departed. “Then he, or any man who has the spirit of philosophy, will be willing to die; but he will not take his own life, for that is held to be unlawful.” Here he changed his position, and put his legs off the couch on to the ground, and during the rest of the conversation he remained sitting. “Very true,” said Cebes, laughing gently and speaking in his native Boeotian [dialect of Greek]. “Yes, I quite agree,” said Cebes. “Yes, Socrates,” said Cebes, “there seems to be truth in what you say. And yet how can you reconcile this seemingly true belief that God is our guardian and we his possessions, with the willingness to die which you were just now attributing to the philosopher ? “That the wisest of men should be willing to leave a service in which they are ruled by the gods, who are the best of rulers, is not reasonable; for surely no wise man thinks that when set at liberty he can take better care of himself than the gods take of him. “A fool may perhaps think so — he may argue that he had better run away from his master, not considering that his duty is to remain to the end, and not to run away from the good, and that there would be no sense in his running away. “We should like you to do so,” said Simmias. 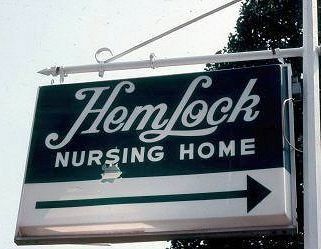 “Never mind him,” he said. 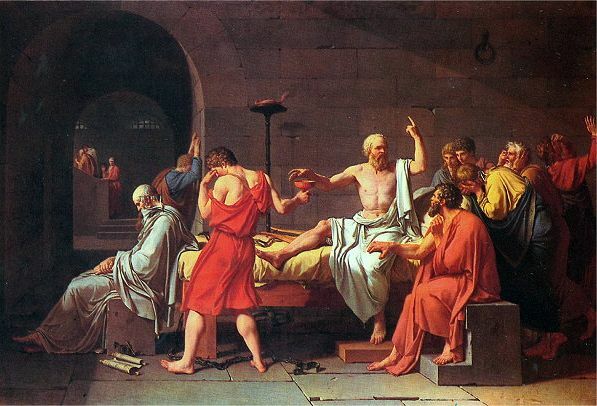 The famous 1787 painting of "The Death of Socrates" by Jacques-Louis David shows the romanticized philosopher pointing skyward to "higher things" while those around him exhibit little understanding but much grief. Among them Plato is shown sitting at the far left, even though he was not in fact present at the scene. 1892 The Dialogues of Plato. Third edition. Five Volumes. London: Oxford: University Press. The full text is available online (link). Several minor variants of Jowett’s translation may also be found on the Internet. This is the last version completed before his death in 1893. 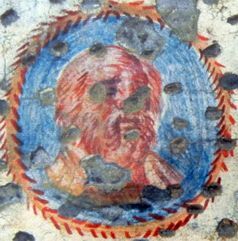 A summary of the entirety of the Phaedo may be found on Wikipedia (link).